This app is horrible. It never changes. Regardless of what the weather is doing, it always says it’s great fishing conditions. Using iPhone hardware or not....it’s a scam. First of all this could be a decent app, if it actually worked. And I gave it the benefit of a doubt before I rated and reviewed it by trying to contact the developer with three separate emails that I received no responses to any of them. 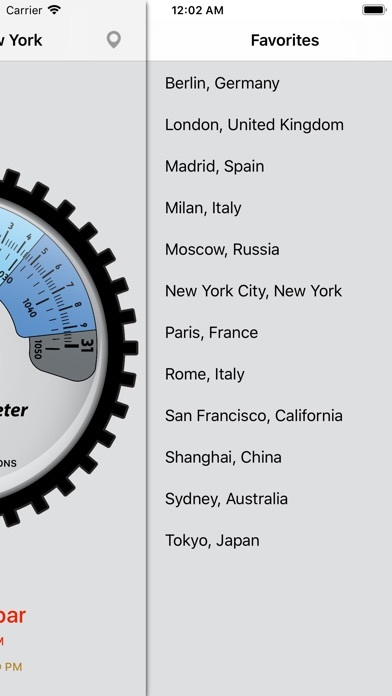 The developer says you should use the internal barometer in the settings for the most accurate results, but anytime I select internal, the needle drops straight down and gives a ridiculous reading, and when external is selected, it always says “Great” like the barometer never changes. Works ok when it works. Sporadic. Works and the doesn't work . Source issues most likely. Doesn't save last reading. 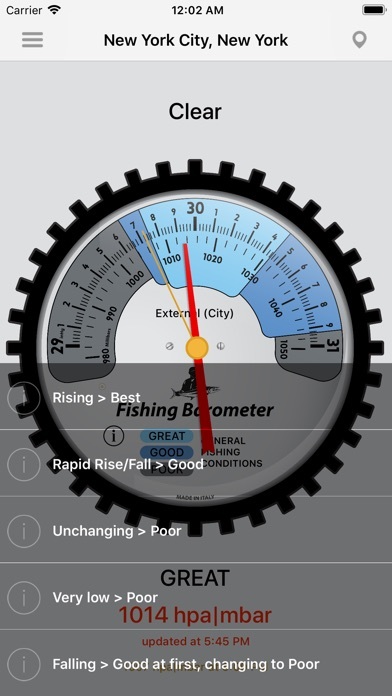 Poor implementation of a barometer, no way to set a sea level offset which renders this app useless for inland fishing. So I woke up to do some ice fishing and felt the need to stay in bed. 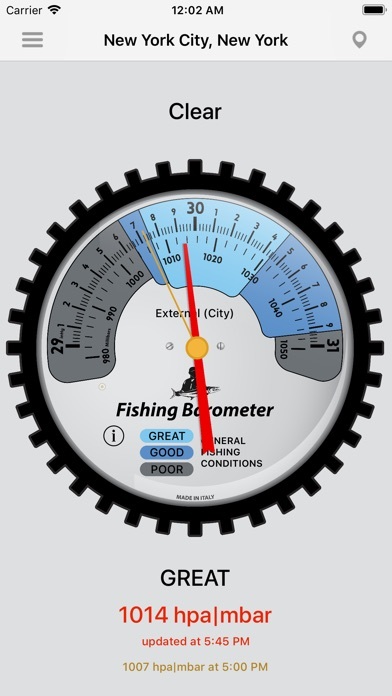 Wondering the barometric pressure, I searched for an app that would give me the pressure yet relate to fishing. I came across this app and gave it a whirl. The barometric reading read “awesome” for fishing, so I dragged myself out of bed and had literally the best fishing day ever, resulting in huge bluegill and perch on a lake that I have always had bad luck. Again! This maybe luck, but will be one app for the fishing toolbox. Always at great, not actual barometric pressure, the numbers are off. Don’t spend your money! Thought it might be a good idea to get this app, much better to go off local weather statistics.